System.ServiceModel.FaultException: The server was unable to process the request due to an internal error. For one of our clients we are working with a claims based web application. This web application has a custom membership provider that is registered at the web application, central administration and security token service level. Server Error in ‘/’ Application. The server was unable to process the request due to an internal error. For more information about the error, either turn on IncludeExceptionDetailInFaults (either from ServiceBehaviorAttribute or from the <serviceDebug> configuration behavior) on the server in order to send the exception information back to the client, or turn on tracing as per the Microsoft .NET Framework 3.0 SDK documentation and inspect the server trace logs. Exception Details: System.ServiceModel.FaultException: The server was unable to process the request due to an internal error. For more information about the error, either turn on IncludeExceptionDetailInFaults (either from ServiceBehaviorAttribute or from the <serviceDebug> configuration behavior) on the server in order to send the exception information back to the client, or turn on tracing as per the Microsoft .NET Framework 3.0 SDK documentation and inspect the server trace logs. 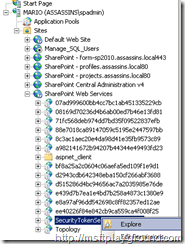 Open IIS and navigate to “SharePoint Web Services” under “Sites”. Click the node open and select “SecurityTokenServiceApplication” use your other mouse button to open the context menu and select “Explore”. <!-- The serviceMetadata behavior allows one to enable metadata (endpoints, bindings, services) publishing. This configuration enables publishing of such data over HTTP GET. This does not include metadata about the STS itself such as Claim Types, Keys and other elements to establish a trust. After changing the “web.config” we received the correct message and we saw that we mistyped the role provider name. Cannot get Role Manager with name Empty. The role manager for this process was not properly configured. You must configure the role manager in the .config file for every SharePoint process.